Langley/Victoria – Construction is about to begin on a $59-million Highway 1 project through Langley, which will create better traffic flow and increase capacity on a key stretch of the Trans-Canada Highway. Highway 1 will be widened from four lanes to six lanes between 202nd and 216th streets, by adding one additional general-purpose lane both eastbound and westbound. In addition, high occupancy vehicle (HOV) ramps will be extended to and from 202nd Street. Noise mitigation measures will be built on both sides of the highway and along the west side of 216th Street from the highway to 88th Avenue. Once constructed, the new 216th Street interchange will have six lanes total, with four travel lanes and two left-turning lanes between the ramps. 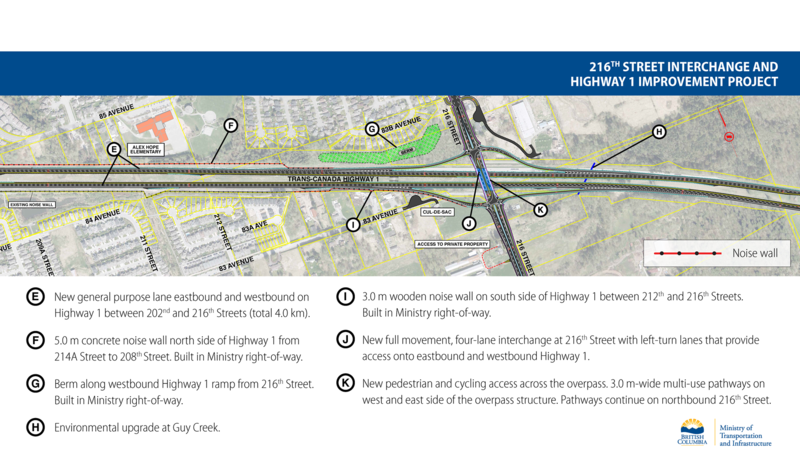 Access to Highway 1 at 216th Street will now be gained through two signalized intersections. 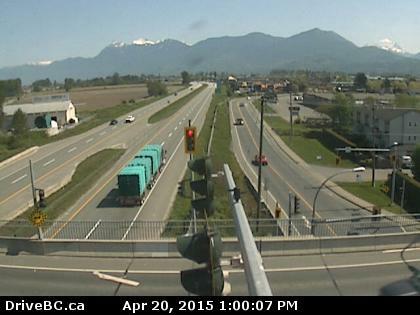 The project is designed to reduce congestion as well as increase capacity and safety on Highway 1 and improve connectivity between Langley communities north and south of the highway. These communities have grown significantly in recent years and the construction of a new interchange at 216th Street has been a Township of Langley priority for decades. Jakes Construction Ltd. is the successful proponent and was awarded a $45.4-million contract to construct the project. This project is expected to provide significant benefits to all motorists, including local drivers, commercial-truck traffic, and tourists, as well as providing benefits to cyclists and pedestrians. Crews will be working mainly outside of peak periods, and Ministry of Transportation and Infrastructure staff will be monitoring traffic 24/7 to ensure delays are kept minimal. The project is scheduled to be complete by the winter of 2019. The project is expected to create approximately 180 jobs. This segment of Highway 1 currently has a daily traffic volume of more than 106,000 vehicles. About 15,000 vehicles on this stretch of highway are commercial trucks. The total estimated cost of the Highway 1 – 216th interchange project is $59-million, with the Government of Canada contributing up to $22.3 million under the New Building Canada Fund’s Provincial-Territorial Infrastructure Component-National and Regional Projects. The Government of British Columbia is contributing $22.3 million as a part of B.C. on the Move, and the Township of Langley is funding $14.3 million. Budget 2017 proposed over $10 billion over 11 years in trade and transportation projects across Canada. 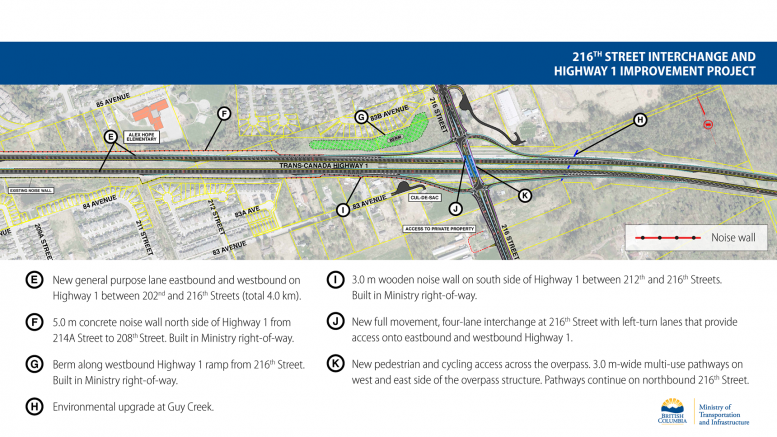 Be the first to comment on "Construction Starting On 216th Interchange – Highway 1 To Six Lanes"